Weekend breakfasts should be easy and special, I think. Especially on the days we all wake up cranky and retreat to our separate computers corners pre and post breakfast, it's enough to know that we sat and shared a meal. During the week my spouse nukes his oatmeal and is gone before the kids wake to eat leftovers, sandwiches, toast or cereal. Me? I just drink tea unless I'm lucky enough to get beet greens in the Community Supported Agriculture (CSA) farm share. Then I'll make this for brunch. But on the weekends I like to do a little more. Even if your "weekend" happens on a Tuesday/Wednesday, it's nice to relax and enjoy a less-hurried meal. I'm a fan of waffles for weekend breakfasts for a few reasons. 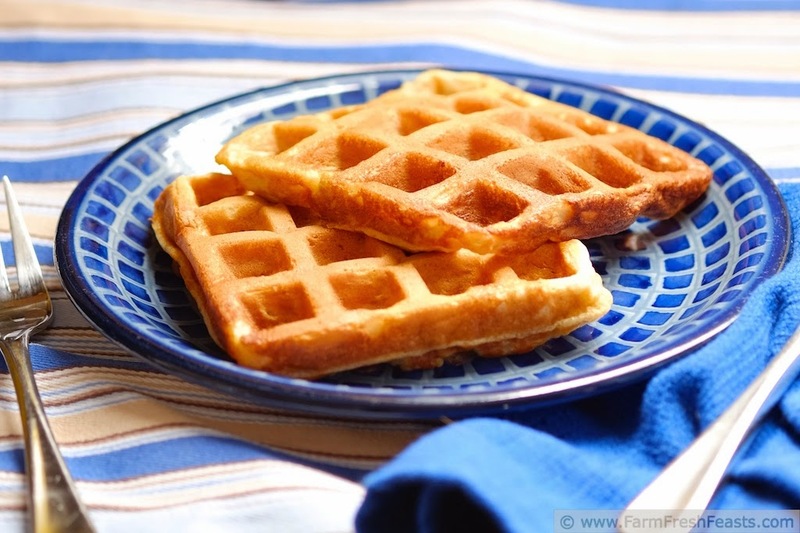 First, waffle batter mixes up easily and improves with a short rest. Second, it's easy to keep waffles warm in the oven while you're making enough for the whole bunch. Third, it's super easy to double the batter, make all the waffles, and freeze some for your kids to eat on weekday mornings. I've shared a variety of waffles on this blog. I've got waffles using butternut squash, tangerines, zucchini, carrots, and even corn and blueberries. Time for one of my standby, 'always in the kitchen' fruits: bananas. Ripe bananas freeze beautifully in the packaging nature provides and thaw quickly. 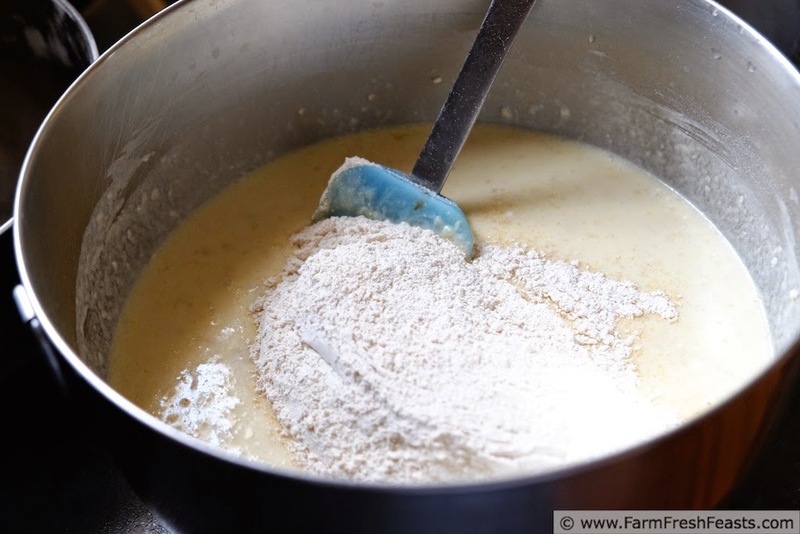 **Alternatively, if you've planned ahead, combine 1 cup of rolled oats with 1 cup of buttermilk, let soak overnight or chilled up to 5 days, then combine with additional 2 cups buttermilk. In a blender (I use my Vitamix), combine oats and buttermilk and blend until smooth. 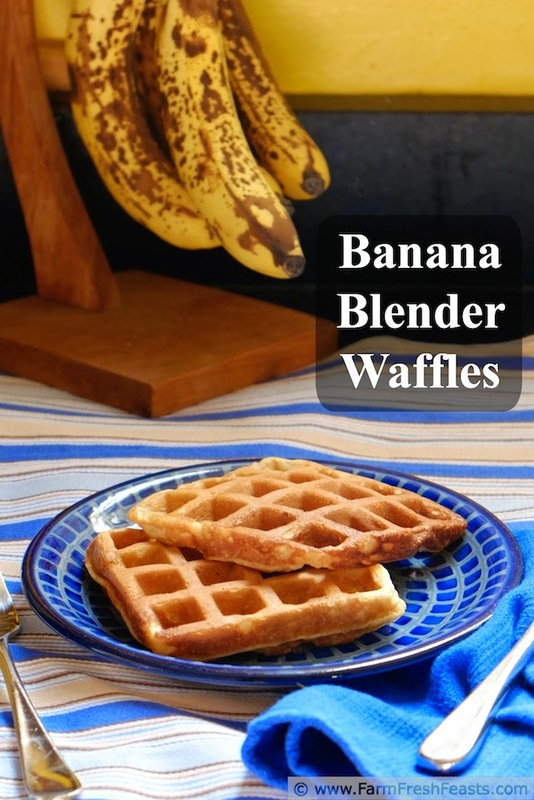 Let stand for 15 minutes, then add the butter, vanilla, eggs and bananas to the blender and blend until combined. In a large bowl, combine dry ingredients. Pour contents of blender into the bowl, and stir until combined. In the immortal words [in my family at least] of Alton Brown, "walk away, just walk away" for a good 30 minutes while the mixture sorts itself out. Preheat a waffle iron and bake according to manufacturer's instructions. If freezing, cool on a rack and then package in bags, reheat in a toaster. I'm craving waffles very bad now. Breakfast for dinner? Yum! My family is always happy for a breakfast for dinner. Heck, they like breakfast for breakfast. Can you believe I don't have a waffle iron? 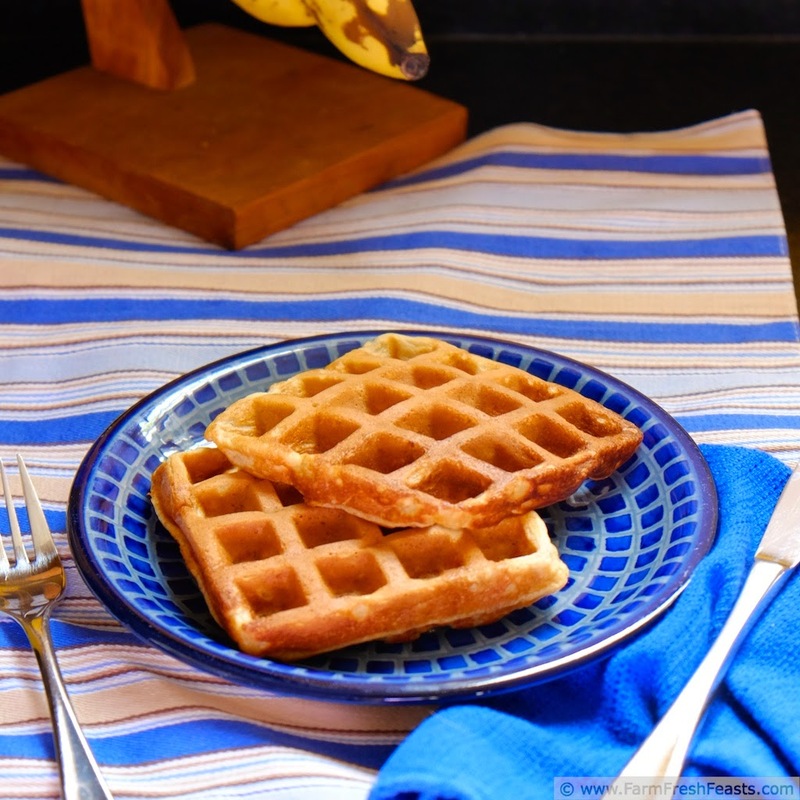 I need to get one - blender waffles sound like such an easy and perfect weekend breakfast! No, actually I cannot believe a cook as talented as you doesn't have a waffle iron. I think it's right up there with my mixer and my blender. I'd say coffee maker, but I'm a tea drinker and could nuke water or boil on the stovetop if my electric kettle vanished. And you're making me wish I had a waffle maker. I love the idea of tossing it all in the blender too; talk about efficiency at its finest. Waffle irons are useful and don't take up a lot of space--mine is actually between the wall and the leg of the table I shoot on/my daughter does her homework in the breakfast nook. Your family is pretty smart! I think my kids would go for chocolate waffles over anything, but I'm not sure.